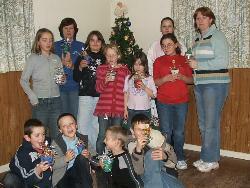 The Youth Club is held every Monday at the Memorial Hall. It is held between 7pm-9pm and all young people aged between 8 and 15 are welcome. The cost is £1.25 each evening. Watch the notice board next to the shop for details of activities taking place, which will include Crafts, Games and quizzes. If you just want to come along and just chat to your friends you will be most welcome. There is also a tuck shop open each week. New helpers are very welcome. For further details please contact June 55845 or Kim 55562 or why not just pop in on a Monday evening.